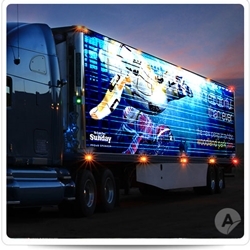 Shine light on your fleet markings and vehicle graphics. DPF 2400, a premium digitally reflective film, has a conformable formulation for fleet and vehicle applications. A brilliantly bright white point and a uniform visual appearance during the night (and day!) will make any graphic shine.